Help an established business clean up and optimize content they’ve been creating for years to enable better visibility and reach of the brand in the search engines. 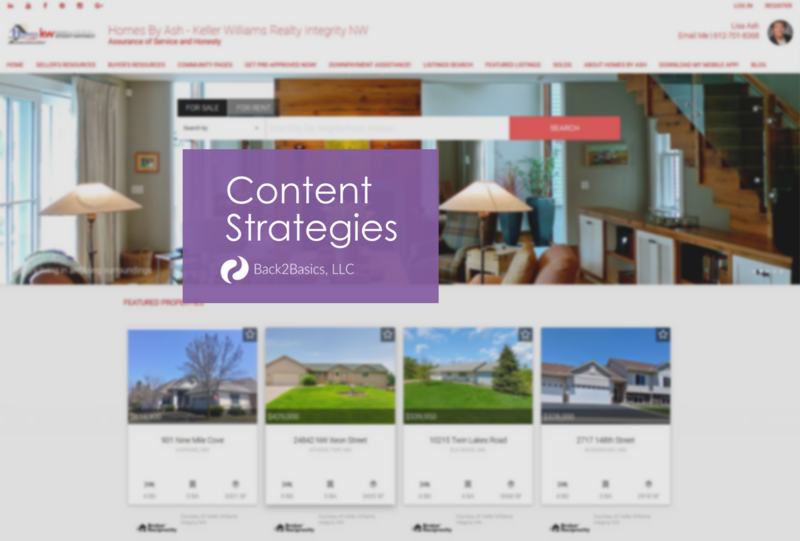 Lisa Ash, a REALTOR® at Keller Williams Realty Integrity Northwest in Otsego MN, and the leader of the Homes by Ash Real Estate team had a desire to tackle a challenging content strategy goal she had been trying to manage on her own over the course of several years. Lisa had all the components in place; social media, a website with a blog, a newsletter, follow up email campaigns and market reporting for clients, postcard mailings and a great client appreciation program, but something seemed to be missing or was at least missing the mark. And, coordinating it all was becoming an all-consuming task she and her Listing Coordinator didn’t have time to properly manage. We started by tackling the HTML formatting of the content on their structured website design. The challenge was in working on a platform where the owner of the site wasn’t really the owner of anything but her photo, logo, and select page/blog post content. The framework of the site and the ability to enhance layouts, SEO, call-to-actions or overall formatting and function was all controlled through a third-party website designer called Placester. The benefit of these types of site developers is their near ‘ready-to-go’ websites that can be up and published within hours vs. days, weeks, or months for more custom designed sites. The hosting and the security are also minded by the provider, taking that onus off the end user/owner. And, all of the IDX functionality for real estate searches is already in place and ready to set up for the individual licensed agent to initiate. The drawback? You cannot add, delete or alter functionality. You cannot change layouts to your own custom design, and if you leave, there’s no way to export your content to take it with you. And, you cannot use the blogging platform to “schedule” content publications or control the post date data. If you draft something, the publication date lists as the date it was first drafted, rather than the date it actually published live. Because of conflicting HTML language between the Placester site and another site the client utilized for marketing, we were seeing a lot of broken content pages published making it near impossible for a visitor to the site to read and navigate, let alone a search engine’s spiders to crawl it easily. Additionally, the client was using the blogging platform to merely reiterate a new listing post or an Open House post… both could be seen in other parts of the site, and neither was being shared from the blog to social media. Instead, they were sharing open house and listing announcements from another lead generating website. So, what was the purpose of the blog on this site? Not much. Furthermore, the scheduling options for this site are short of a nightmare for someone who wants to routinely create content but needs publication dates to be reflective of the date they want it to become available to the open public and the SERPS (search engine results pages). Finally, we needed to have drop dates coordinated with top-of-the-month email newsletter marketing campaigns so all of the corresponding backlinks to the variety of online resources cited in the emails were correct and applicable. Time was to be everything, and this was not a client who could or would benefit from a fully automated system of content development and management. Not only were we able to work out a rhythm with the client and their team, we were able to expand on our original goals and began incorporating additional posts, short animated/video snippets, and a brand design cleanup over the course of a couple of months. We continue to work with this client today on content development strategies. In addition to an increasingly growing number of visitors and sessions to the Homes by Ash website as compared to the same time last year, the team continues to see steady interest and engagement within their social media and newsletter distributions.